I’ve invited some incredibly talented guests to share with us here at Simple as That and today I’m thrilled to introduce you to Jenny Layton of The Happy Gal! She’s a absolute doll and is truly a wealth of knowledge on the topics of health and wellness. Her blog is such an inspiring and uplifting place to be and today she’s sharing some amazing healthy snack ideas for kids! I don’t know about you, but I run out of snacking ideas for the kids about six hours into summer vacation. We all know the “Good Mom” drill: offer them apple slices, carrot sticks and string cheese…but my good intentions are met with moans and groans, and it’s not long before I find myself buckling to the pressure of potato chips and ice cream. So here are some snacking ideas that might get you part way through June…or maybe even all the way into July! Fruit kabobs – the fun is in the making of these babies. Chop up a bunch of fruit and let the kids build their own. They love the power of customizing their own kabob! Watermelon Pops – why is it that everything is more fun when it’s cut into shapes? Let the kids pick the shape, and if you’re really feeling adventurous, insert a stick and call it a Watermelon Pop. Homemade Protein Bars…but shh! Don’t call them that. They double as no-bake cookies. The kids will never know the difference (and you will love that they are a good source of protein without any added sugar.) Click HERE for the recipe. Homemade Popsicles – I still remember getting excited to make these as a kid. We are eons past the days of pouring Kool-Aid into popsicle molds, however. Now we have recipes like THESE to make it healthier and tastier. Snack Sticks – Think long and skinny, and you’ve got the right idea for this snack. Start with healthy ingredients like carrot sticks, whole wheat bread, cheese, apples, pretzel sticks, etc. Cut them up in sticks, and let the fun begin! Toothpick Snack – Same idea as Snack Sticks, only this time everything has to be eaten with a toothpick. Cut bread, cheese, bananas, apples, even turkey into chunks, and model to the kids the art of eating with a toothpick. (Grapes are a favorite for this snack!) This actually doubles as a lunch favorite. For more healthy lunch ideas for kids, click HERE. Frozen Bananas (or ice cream?!) – These are a hot item at my house. When they are too ripe to eat, I slice them up and freeze them for smoothies (great smoothie recipes and tips HERE.) But I soon noticed little hands digging into the banana bag, and the perfect treat was born. If you are feeling extra ambitious, try pureeing them to make “ice cream.” So refreshing, and fun to add different toppings. See recipe HERE. Your turn! 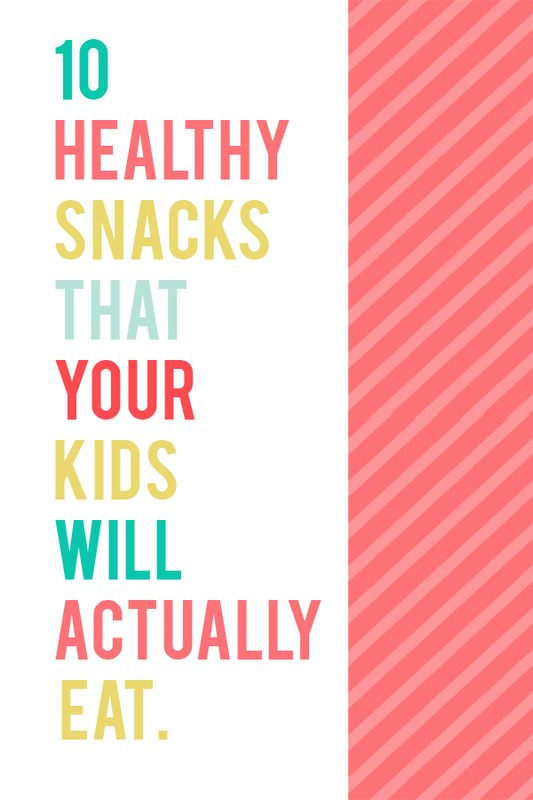 What are some of your kids’ favorite healthy snacks? Jenny Layton is the owner and creator of the blog The Happy Gal. Her new cookbook,“Healthy Eating The Happy Gal Way” teaches women how to make healthy eating easy and delicious – and create great results. 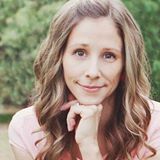 As an author, speaker, blogger, coach, and professional organizer, Jenny helps women create a life they love, full of peace and purpose. Hi Rebecca – what a fantastic bunch of snacks to keep the little happy and healthy all summer long! Visiting from i heart nap time and pinning. Will definitely visit Jenny, too! 🙂 Hope you have a happy Memorial Day weekend! Glad I’m not the only one that runs out of ideas for snacks! Thanks so much for sharing these – great ideas!! 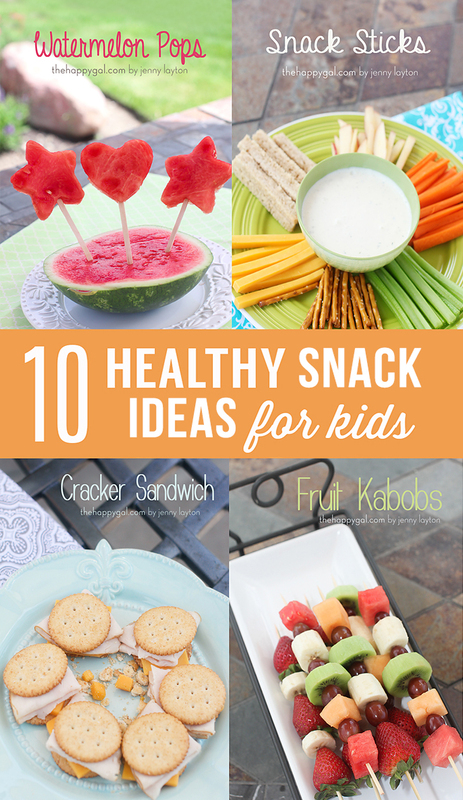 My kids want to eat ALL THE TIME….so these ideas are perfect for us!! My kiddos love hummus. Thanks for the wonderful ideas. I love reading everyone’s snack.ideas. They’re all so great!!! Such a lovely ideas – fun and easy! WE are a bit picky and love our grapes nice and firm. after the kids have picked out the “perfect” grapes, i freeze the rest. my kids ALL love frozen grapes (and cherries for that matter).